Somewhere you stated that the cache needed be cleared after about 3 hours playing. Normally I leave my system on all day. So far I didn't have any memory problems using Snakeoil at all. But is it possible to schedule this so that it gets cleared automatically? For example in between playing two songs? (01-Jun-2016, 07:21 PM) Leonard Wrote: Somewhere you stated that the cache needed be cleared after about 3 hours playing. Normally I leave my system on all day. So far I didn't have any memory problems using Snakeoil at all. But is it possible to schedule this so that it gets cleared automatically? For example in between playing two songs? In between songs may well not be ideal as the software player may well already be opening the next track (and pre-buffering it). Scheduling is a good idea, But Snakeoil don't have any scheluding program installed I think. Will have to double check and see if it's possible. This cache clearing thing is only experimental feature for now, to see if if it does anything, so far I find it doesn't make any difference, but still early stages as I havn't tested this in detail. (01-Jun-2016, 08:59 PM) agent_kith Wrote: Scheduling is a good idea, But Snakeoil don't have any scheluding program installed I think. Will have to double check and see if it's possible. This cache clearing thing is only experimental feature for now, to see if if it does anything, so far I find it doesn't make any difference, but still early stages as I havn't tested this in detail. I assumed linux would also have some kind of taskmanager running just like Windows. If not, it may be better not to introduce it as well as it will also consume processor power. On the other hand; I notice that after a while (several hours) loading a new playlist takes longer in my setup (USB + casper-rw). 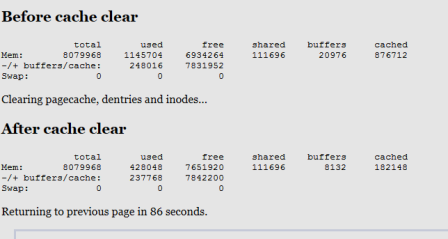 Below a screenshot of how much memory was used before clearance. Good to have the option to do it manually as well! (02-Jun-2016, 06:57 AM) Leonard Wrote: I assumed linux would also have some kind of taskmanager running just like Windows. If not, it may be better not to introduce it as well as it will also consume processor power. It does. there are several actually, the two I remember are cron and at daemon. These two processes are not installed on the 32 bit OS, just not that sure about 64 bit (as I havn't checked it thoroughly). (02-Jun-2016, 06:57 AM) Leonard Wrote: On the other hand; I notice that after a while (several hours) loading a new playlist takes longer in my setup (USB + casper-rw). Hmmm that's interesting. I wasn't sure how useful the clear cache feature is until this picture. 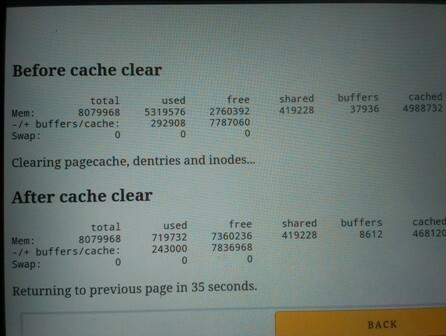 Your screencap is telling your system is caching far more things than mine (see last column tittled cached). This may be a USB persistent mode thing and I'd see if I can optimise that in the future. Caching is good in general, as it speeds things up, but as the time progresses, the system may be caching the wrong things more and more. Very roughly speaking, when the system try to look up the cache and don't find what it wants (cache miss), it needs to go to the storage and retrieve the results, and cache what it thinks will be reused again. All potential things that can affect sound quality. Clearing the cache will "reset" the cache and let the system start from scratch again (think of it as resetting parts of a computer). For your system this feature actually will be useful (as I think 50% of your RAM is used up as cache). Which player are you using? And are you using 32 bit or 64 bits? (02-Jun-2016, 08:15 AM) agent_kith Wrote: Which player are you using? And are you using 32 bit or 64 bits? I am using Squeezelite on a 64 bit system. I have also tested it booting PXE without persitant memory. Have been able to test the MPD player as well (using version 0.19). With this player the memory footprint doesn't grow over time. (03-Jun-2016, 04:33 AM) Leonard Wrote: Have been able to test the MPD player as well (using version 0.19). Thanks for the update.. I'd test this in my setup soon and see if I get the same thing. Not sure really if caching is good or bad at this stage really so it's something worth investigating (esp after that interview article of Swenson where he claimed there is a strong correlation between memory access and SQ).